And he gives us everything we need. He provides for us just like he provided quail and manna for the Israelites as they travelled through the desert in Exodus. 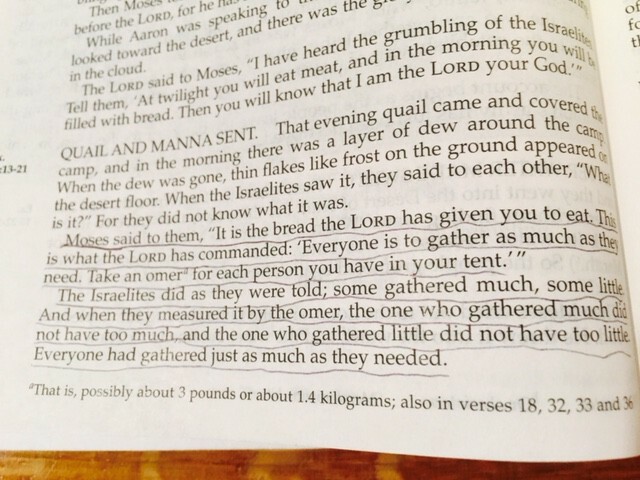 Each one of the Israelites had all the food they needed. God provided for them….and he provides for us now. Living in our materialistic culture, we can often be lured into thinking that we don’t have enough. We start worshipping the god of More. We can quickly be enticed by the need to have more. We end up spending our time and energy on getting more instead of building a close relationship with our omnipotent God who created it all and would give us more if he wanted us to have it. He tells us in Luke to be faithful with what we have – that is his provision for us. Do we have enough faith to be content with what God has already given us? Do we trust God enough to put away our lists of wants and live of life of contentment and generosity? Thank you, Abba Father, for all of the things you have already provided for us.